Mobile devices should be a means of integration rather than discrimination. They offer new ways of overcoming disabilities and have the potential to make life easier for the disabled. This is HelpTalk's purpose. HelpTalk is directed at people unable to communicate fluently orally or through writing with health professionals, family or any other person. 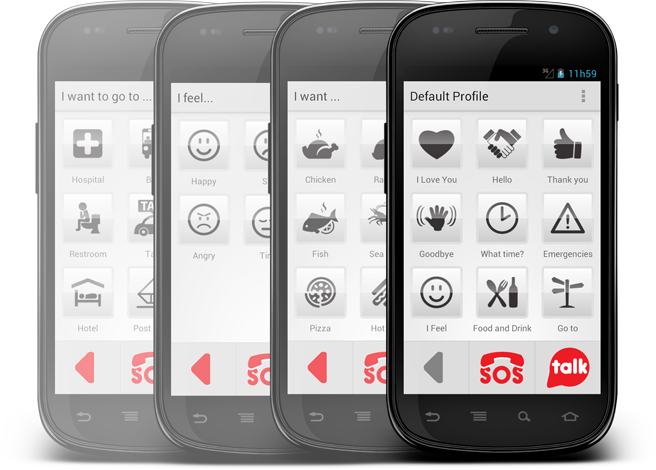 HelpTalk allows users to create sets of actions that represent their needs in terms of communication, with the actions most suited for each disability/user. When the user taps each of the options the device speaks the selected command. 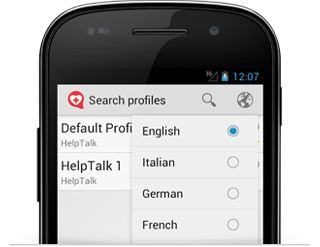 With HelpTalk, you can create a profile containing the actions most useful to any situation. A user can create a profile suited for their day-to-day life, a specific event, travelling, education, etc.. It helps people unable to communicate in a traditional fashion (people with aphasia, tracheostomized, ventilated with endotracheal tube, muteness, autism, illiterate, other language, children, etc.) to express their basic needs. When each action is tapped, the device speaks the respective command. Create profiles in multiple languages (English, Spanish, German, French, Italian, Portuguese, Finish, Danish, Hungarian, Norwegian, Polish, Swedish). All you need is a Text-to-speech engine for the selected language installed on the device. If what you want to express isn't contained in the currently loaded profile, just switch to the "Talk" screen and you can write any sentence you want. HelpTalk remembers the most common sentences typed, so that you can have easy access after writing just a few characters. For users with reduced dexterity, HelpTalk presents two big Yes/No buttons. If what the user wants to express isn't contained in the currently loaded profile, the user can switch to this screen to answer basic questions. 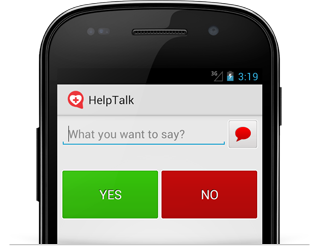 HelpTalk allows the user to configure an emergency phone number and an emergency message. When the user taps the S.O.S. button, an SMS message is sent to the configured number. The user also has the option to include his current location's coordinates. In cases where a user might suffer from any condition that may leave him disoriented (Alzheimer, Parkinson, dementia, etc. ), being able to be located by relatives is crucial. 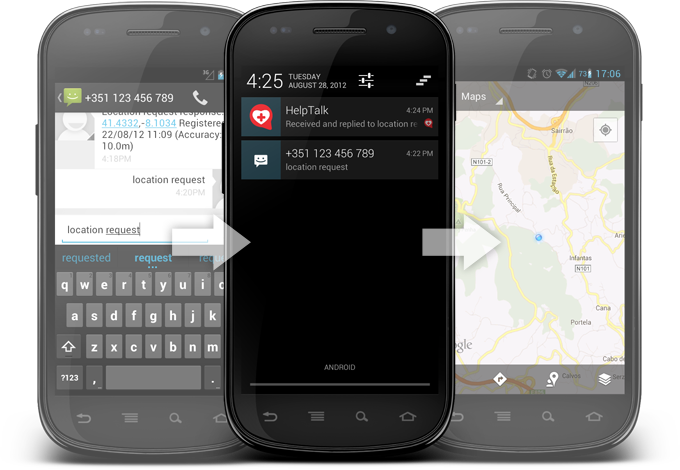 Using HelpTalk, when the phone receives a specific message from a specific number, it replies with the user's current location. For increased security, the user is allowed to set a custom trigger message and the phone number authorized to send the location requests.